The event is part of the 6-week implementation program that the Honiara schools took part in October and also this month. The key feature of the event is the football competition which will be playedin the Under 10 and Under 12 categories. As of today 21 teams have signed up for the competition. The competition shall be played in the tournament format for each category. There will be a group stage in which teams will play in the league format and the top 2 teams from each group will proceed to the finals stage which will be played in the knockout format. All teams in the competition are required to have 15 players of which 9 are boys and 6 are girls. The schools that will be taking part in the event are as follows: Tamlan, Bua Valley, Lungga, Norman Palmer, SITTC, Burns Creek, Ilia, Honiara International and White River. Two communities, Fishing Village and Koa Hill, will also be taking part. According to Phillip Ohoto’ona who heads the Solomon Islands Football Federation (SIFF) special projects office is the main man behind the event and he says that the aim of the event is to reinforce the objectives of the Just Play program with the teachers and the students. “Just Play aims to promote interchange, education and sports amongst other things and we hope to see that happen on that day. My office is working hard to ensure that the event will deliver fun and enjoyment to all concerned especially to the children,” Ohoto’ona says. “The theme ‘Just Play for Health’ highlights one of the main goals of the Just Play program itself. Through engaging in sports we can overcome the challenge of lifestyle diseases such as obesity and diabetes and this is a message we want to promote on this day,” Ohoto’ona says. The program for the day will start in the morning with the formal opening ceremony and the competition matches will kickoff thereafter. The presentation of trophies will wrap up the event at the end of the day. 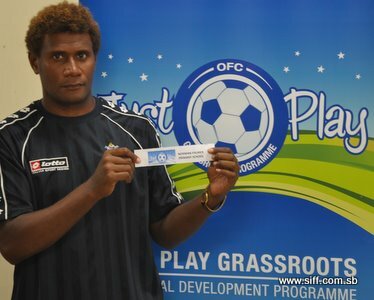 The draws for the competition were held this afternoon at the SIFF academy complex in Honiara.